The Poem Farm: Poetry Friday is Here! Wallow in Wonder with Me! Poetry Friday is Here! Wallow in Wonder with Me! Happy first Poetry Friday of National Poetry Month 2016! I am so glad that you have joined me in this warm gathering of poetry friends, and I hope you will continue to join us in our poem-festivities all month long. If you wish to learn more about all poetry happenings in the Kidlitosphere throughout the month, please visit Jama's Alphabet Soup. There you will learn about many poetry challenges and other goodnesses you can enjoy each day of April. If you are new to Poetry Friday, please know that we celebrate poems each week, all year long. You can learn more about Poetry Friday at No Water River. We welcome everyone, always! 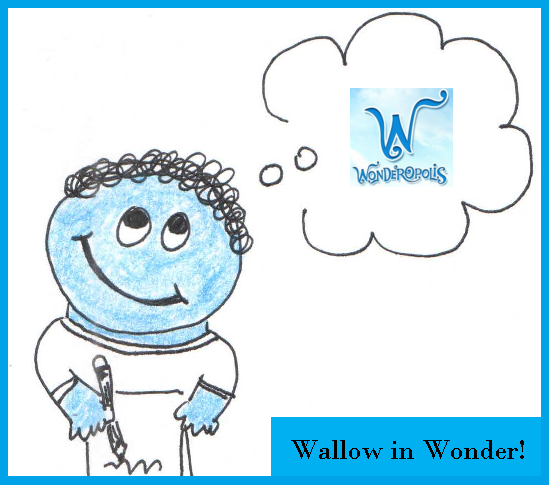 Welcome to Wallow in Wonder! For my 2016 National Poetry Month project, I will celebrate learning and writing from learning, writing poems from each daily Wonder at Wonderopolis. As I did with my Dictionary Hike in 2012, I am looking to surprise myself with new inspiration daily. This year, such inspiration will show up in my inbox each morning. I will print it and carry each Wonderopolis Wonder around all day...and in the afternoon or evening, I will write and post the poem for the next day. I invite anyone who wishes to take this challenge too. Just read today's wonder over at Wonderopolis, and write a poem inspired by it for tomorrow. Share it tomorrow at your own site, and if you wish to link in my comments (or share your poem there), please feel free to do so tomorrow, the day after the Wonder is published at Wonderopolis. Students - I often write about things "I was before." Whether I really have been these things before or not, I feel that I have been. Writing poems allows me to revisit parts of myself that I have not visited for a long time, or maybe even ever. Today's poem, as will be true for all poems this month, was inspired by yesterday's post at Wonderopolis. I am challenging myself to learn about different subjects and to see what poetry-journeys I will take with these topics. Writing is an adventure...always! You may have noticed that this poem has a very regular meter. What do you notice about the syllables in each line? What do you notice about the rhyme? This is actually a special type of poem called an English - or Shakespearean - sonnet. While this month's poems will not always be so form-focused, I do enjoy tapping out syllables on my cheek or desk. 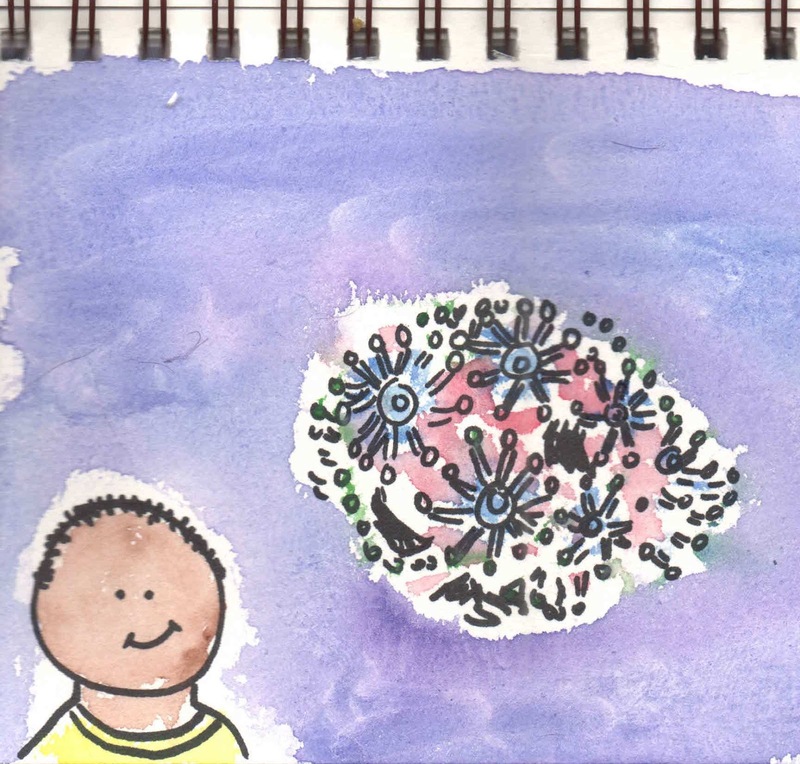 You can read another coral poem if you visit Wonder Lead Ambassador, literacy advocate, teacher, and writer Paul Hankins at his Wonder Ground blog where he, too, is writing daily poems from Wonderopolis wonders. Much gratitude to my friend Robyn Hood Black who is hosting me at Life on the Deckle Edge today with an interview about EVERY DAY BIRDS, my new Orchard/Scholastic book illustrated by Dylan Metrano. It is such fun to be at her place and to see Robyn's kitty reading all about birds. 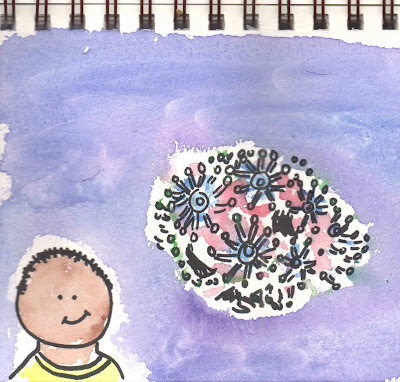 It has been fabulous to host teacher and writer Stacey Dallas Johnson at my other blog, Sharing Our Notebooks this month. If you have not yet read her post, please do so by Sunday...and leave a comment to be entered into the book giveaway too! If you have a Poetry Friday post to share to begin this magical month, please do so below. I look forward to visiting all of these blog posts and finding new poems to love. Happy Happy Poetry Month...and Happy Poetry Every Moment. I look forward to wondering with anyone who wishes for the next twenty-nine days! Love that the poem is a sonnet. How DO you manage to teach, run more than one blog, be part of your family and community, raise those chickens and also write and draw?!?! The caption to Link #3 was supposed to say something about TeachingAuthors but I messed up. Oh, well. Life on life's terms! Oh, the wonder of a sonnet! Such a tricky form to write - it almost ties my brain in knots. Thanks for hosting Poetry Friday in amongst all your gloriously-busy creativity, Amy. Thanks for hosting us today, Amy! And thank you for pointing out that your poem is a sonnet -- I noticed that it was special, but it's too early in the morning for me to put a name on it! April 1st. How wonder-ful! The very first day of Poetry Month and our glorious weekly Poetry Friday roundup coincide down on the farm--your Poem Farm, where we're raising (a la Kilmer), not trees, but poems fashioned by fools like me--no foolin' ...Seriously, it is a blessing to be here, in this fertile place, under your sage cultivation. Thank you for all the many ways you're raising a new crop of poems this month and always. God bless you! Happy Poetry Every Moment, indeed!! Thanks for hosting us! I'm looking forward to a wonder-full month! What a very colorful past life that must have been, Amy. :) I love the learning aspect of your NPM project, and the habit of opening up to new possibilities in poem-making daily. Happy poetry month to you, Amy, and thank you for hosting PF today! Good morning, Amy, and many April Wonderations to you! Yes, a sonnet, but a very gentle one with a lovely conversational tone. I like to think that you were coral once, and especially "I cling to my opinions and beliefs." Isn't Wonderopolis grand? I hope Paul will be linking his project up here...and don't forget to send me a Poetry-Music Match-Up (or PMMU!) one day this month. I can't help feeling--"enchanted by a song"--that you've got plenty to choose from! I really do love the idea that "each of us was something else before." That invites wonder, and empathy, and connection---all the things poetry does so well. My post for Poetry Friday was inspired by a fresco at The University of St. Thomas in Minneapolis, and is part of the year-long poetry challenge I've undertaken with my Poetry Sisters writing group. Such fun to see how other poets interpret the same image! Good luck on your Poetry adventure this month, and thank you so much for hosting! What a cool poem, Amy. Even better that it's a sonnet. I like the idea of one-ness that you're exploring through the coral. Today, I'm pairing a Mary Ann Hoberman poem, "Brother," with a new middle grade novel about brothers. TREASURE AT LURE LAKE is an adventure story set in the Colorado woods, but it's also about the relationship between two brothers. Love your coral poem, Amy--and what a fabulous idea for poetry month! I especially love the poignant ending. We could be, would be, should be, have been (?) so many things in life--it's always humbling to remember how little we actually can get to in the numbered days that we have. Thanks for hosting and getting National Poetry Month off to a great start here! What an ambitious undertaking, but I can't think of anything more wonderful than writing poetry about wonder. I wonder if I'll give it a try. ;-) Thanks for hosting this week. You make doing all this look easy, and I know it isn't. So well done! I love Wonderopolis! I used it with my students in computer lab when I was teaching. Thanks for sharing your first wonderful, wonderopolis poem! And thanks for hosting! Happy Poetry Month, Amy! Looking forward to all the wondrous poems you'll be writing this month. I love the idea of "what you were before," and enjoyed "Coral Memories." At Alphabet Soup I have a Q&A with Julie Fogliano about WHEN GREEN BECOMES TOMATOES + a giveaway. Thanks for hosting today! There's so much going on for NPM it's going to be hard keeping up, and now you've added Wonderopolis to the mix! Have a great April! Appreciations for swimming into coral poem making. And for your invites to visit these nourishing links. Great big chirps for your new bird poem book!! Happy Blogging 6 year Birthday & Happy Poetry MOnth! Love your "wonder" ful project for the month! It's quite a "wonder" that you wrote a sonnet for the beginning of poetry month, Amy. Wow! Love thinking of what we were "before". Happy Poetry Month, and thanks for hosting! Happy Poetry Month!!! I love your poem. I miss my blogging friends and being a part of Poetry Friday every week--but family responsibilities come first. That said, I love being a nanny granny and taking care of MY GIRLS. It is such fun to watch them change and grow. Amy, what a "wonder"ful way to start this month of poetry. I love your focus for the month. And a sonnet to start--very ambitious! Looking forward to seignior next week! Celebrating poetry! I have decided to take up the challenge for this month. I don't have my own blog. So I will share my short poem here. Hope you like it. I need you, I need you, I need you! We survive all kind of weather. I wouldn’t survive at all. I need you. I need you. I need you! I *really* like that. There's such a sense of longing, but of rightness in that. Thanks for hosting! Happy National Poetry Month! That's quite the challenge you've set for yourself - but based on this sonnet, it looks like you're off to a great start! Thanks for hosting, and happy blog birthday again! Oh my gosh, what a bounty of poetry wonder! Thanks so much for hosting this Poetry Friday and launching National Poetry Month, too! Happy National Poetry Month! Thank you for hosting this poetry party today, Amy! I love the idea of being a coral polyp with warm, tropical waters washing over me. Looking forward to reading more of your wonder poems! Looking forward to following your journey of wonder this month. I wonder where it will lead you.